Unless you’re well-versed in Mother Goose, you’re probably like me and you’ve never heard the nursery rhyme of the bell horses. Long before people and goods were transported by car and diesel trucks along major highways, horses pulled wagons along narrow roads. And before there were headlights, the only thing that could prevent passing wagons from slamming their wagons into each other was for the horses to be wrapped in bells, letting each other know that they were approaching. 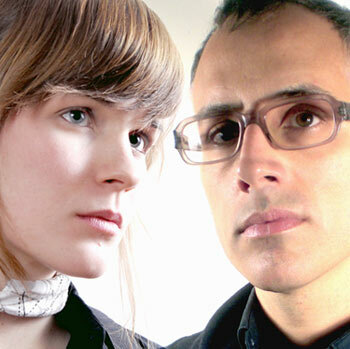 A modern, digital age musical equivalent of that could be applied to the songwriting style of Bell Horses, a new project consisting of folk-pop singer/songwriter Jenny Owen Youngs and electronic artist Xian Hawkins. Instead of writing and throwing ideas off each other in the same room, Youngs and Hawkins were elsewhere geographically and shared their ideas by email. The results make up This Loves Last Time, a lush intertwine of their two sounds; two completely different styles of music that merge, mesh, and somehow work together. It brings out sounds of each artist that one might not notice by themselves. The album is further brought together with vocals by Alexander Ericson of the Northern Territories, percussion by Michael Lerner of The Antlers, and violin and viola by Eve Boltax. How did this project come about? How do you and Jenny know each other? I was listening to the radio when I heard Jenny’s “Voice On Tape.” I had just started work on another Sybarite record and was looking for vocalists to collaborate with. I felt she’d be a perfect fit and was fortunate that she was open to it. We exchanged some music, struck up a friendship, then met up in New York City for drinks and decided to try working together. The album was created back and forth via email. Can you tell me more about how that worked? I would upload sketches to Jenny and Alex for them to listen to, digest, and see if the music was a fit. In some cases it wasn’t and there were a couple instrumental tracks that were scrapped. In Jenny’s case she would work up vocal melodies and the lyrics would follow. It was a volley. She’d mail a rough take and then we’d often re-structure the song a bit around that — then I’d flesh it out until it was complete. I tried to keep things simple the first go round so they weren’t presented with something that felt confining or creatively too exact. When did the two of you start sending ideas back and forth and how long did it take you to be ready to record them? This record actually took kind of a long time (two to three years, somewhere in there) but mainly because it was very spread out. That was due to a number of different factors — moving, tours, work. On top of the life stuff, I’d been focused on a Sybarite record and the more we worked the more I realized this was something different — and I wanted it to be. So, from where it began to where it was complete, things changed between. Did you and Jenny see each other at all throughout the writing process or not until you went to record? The funny/interesting thing about this record is that we were never together while recording — ever. It’s a truly 21st century collaboration. Odd as it may sound, recording together in the same room seems daunting now. Jenny and I have had a shortage of face time though not for lack of want/trying. Our friendship has bloomed mainly by phone and emails. We’re both just really busy and I moved from New York to Western Massachusetts when we started working. Then she started touring more, so it’s been hard for schedules to meet up. How did Alex, Michael, and Eve get involved? I was turned on to Alex through a suggestion from Mark Van Hoen (Locust) who had seen him perform and later went on to produce his band Stjarna. Michael, who played some percussion on the record, is one of my best friends and has been for years. Eve is in school where I live, studies composition and performance. She’s a very flexible and competent player. Who wrote the music? What instruments and equipment were used? I wrote all the music with the exception of ‘Photograph’. Alex tracked some piano, organ, and guitar parts on that and I later re-worked the guitar parts. Though there are a fair amount of electronics on the record, most of the beginnings for the songs were guitar or bass. My first instrument is guitar so it’s what I often go back to when writing. We recorded Eve’s violin and viola parts in the church and Michael’s drum parts were tracked on my laptop in his Brooklyn apartment. I wanted to focus as much as possible on natural sounds mixed with the electronics. In addition to the guitars there’s piano, rhodes, a lot of percussion instruments, and a bunch of samples from around the house that were tweeked accordingly. The lyrical content was left entirely up to Jenny and Alex — really no input from me. I contributed suggestions/approaches to a few things, but largely they were responses to the music. Is there an overall theme or mood you were attempting to reach with the album? When recording I was hoping to create a kind of sound-world, something that can be immersive — articulating that is difficult. I’m always after something emotive and creating a space to get into and inside of with the music. It’s meant to be subtle in it’s way (which is I guess the “ambient” aspect of it) but requires a bit of effort to get out everything that has gone in. Are there other artists who inspired the sound of the album? What were you guys listening to while writing? Jenny and I swapped some mixes in the beginning — Kate Bush, David Sylvian and Nine Horses, Broadcast, Lisa Germano, Fleetwood Mac, Siouxsie and The Banshees, Joni Mitchell. At one point we were talking about trying a cover. Jenny had a Fleetwood Mac song she liked (can’t remember which now) and I wanted to try a Joni Mitchell song called “Jungle Line” off of Hissing of Summer Lawns…a tall order. Needless to say, we never got to it. For me one of the things that’s great about this project is that our influences and approaches are really quite different — rather than detracting, I think the distinctions imbue the music with something unique. The story behind the bell horses is really cool. Care to tell a bit about the album title? The album title came from a song that I was writing/singing that I decided not to include on the record. Most of the songs are (unsurprisingly) about love in one form or another. So I was thinking about how relationships don’t really end and how they carry over. If you believe that life cycles and the same energy comes about again in a different form, I was envisioning the end of it, when it’s really over — not in any morbid sense, but just that everything has a conclusion. Are Bell Horses going to tour or at least play a few shows? This time around there are no plans to perform. Honestly, the work for this record was so studio-oriented I wasn’t really thinking about that while writing. As an afterthought, I wish I’d considered it more, as the response so far has been really positive and I’d love to be able to perform the songs. The hesitation to do so is mainly my own. Jenny is a master — she tours all the time, I am a novice — I need to hone my skills! I think with the next Bell Horses effort the emphasis will be on creating something that we can play and, when the time comes, probably re-working some of this material. So there are plans for another Bell Horses record? Yes. Trying to change up the writing process a bit so this time the songs will be developed with performing them in mind. Currently working on new stuff and headed for some recording once Michael is back from Antlers UK tour in December. For the immediate future there’s a remix record in the works, which I hope will see the light sometime early next year.